​The world had its eyes focused on the Philippines last February 18 as Toyota Motor Corporation held the world premiere for its newest Hiace model, designed for overseas markets. TMP president Toru Suzuki delivers a message that echoes worldwide during the global premiere of Toyota Hiace aptly held at the Bonifacio Global City. By hosting the new Hiace’s worldwide launch in the country, Toyota Motor Philippines asserted the Philippines’ position as a primary market for Toyota’s range of iconic vans. Aside from being the preferred family van of the Filipino people, previous generations of the Hiace have also become a common fixture in providing mobility services to both public and private sectors, helping promote education, tourism, healthcare, and more. “We, at Toyota Motor Philippines, are honored to host the World Premiere of the All-New Toyota Hiace. 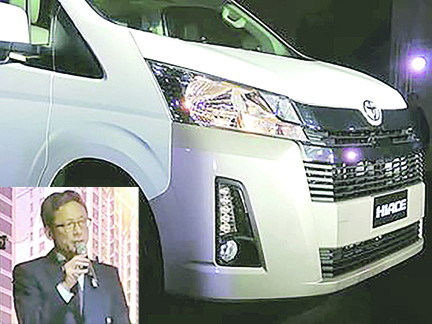 For the first time, the world’s eyes are on the Philippines, to witness the unveiling of the Full Model Change Hiace, never before exhibited elsewhere,” said Satoru Suzuki, TMP president. The Hiace has been one of Toyota’s representative global vehicles since it first launched in 1967, selling more than 6.24 million units in over 150 countries. This new Hiace, built upon a special revised platform that placed great care on enhancing comfort and safety, is designed to perform with extreme durability and excellent basic performance, making it suitable for both daily life and business use; from family drives out of town to heavy weight deliveries straight from the factory, the Hiace can conquer all sorts of jobs. Over the last decade, demand has risen for passenger transportation, such as tourist minibuses and logistics vehicles. Toyota, noticing this, created a model that could be relied upon in many markets, and in doing so allowed customers and partners to enjoy a vehicle that responds flexibly to the diverse needs of everyone who should sit behind its wheel. Empowering the local population throughout its 25-year presence, the Hiace was first introduced on Philippine shores in 1994 and has since then sold more than 135,650 units. Known and trusted by many Filipinos, the Toyota Hiace is the leading model of the utility van segment with a 55.6% total market share last 2018. In the Philippines, the Toyota Hiace is a transportation staple that ferries people, moves cargo, and shuttles clients over great distances whether in urban centers or rural countrysides. Apart from bringing families together through precious memories and experiences on the road, the Hiace is also often the platform by which goods and services are built upon. It connects providers to consumers, such in the case of school and company daily shuttles, hotel and airport complimentary transport, as well as local travel and tours for big groups. The flexibility and versatility of the Hiace’s interior space also allow owners to customize it for business purposes. Toyota aims to offer a modern and practical solution with the new generation Hiace—functionality made even better. Guided by these principles, it is with utmost pride that TMP pushed to uphold its current status as the number one distributor of the Toyota Hiace model outside Japan, out of 150 countries where the model is present. TMC and TMP officially introduced three variants of the new Hiace: the GL Grandia Tourer, the GL Grandia, and the Commuter Deluxe. Both the Commuter Deluxe and the GL Grandia will be available for retail in all Toyota dealerships nationwide starting March 5, 2019. The GL Grandia Tourer will be available in early April. Two body types are available: Normal/Standard Roof and Long/High Roof. Leveraging the semi-bonnet package, the Hiace’s most important features―its reliability, toughness, and functional beauty―are evolved and enhanced, creating an external style that suggests a comfortable and sophisticated space. Layouts with multiple rows of seats or increased storage space are available to suit various uses. Up to 17 people can be carried in the “Commuter” versions―the most in its class―for private bus use. A specialized interior and functions for comfort are adorned in the new “Tourism” versions. The “Van” versions feature storage space sufficiently large for pallets from any country or region. The new Hiace offers greatly improved ride comfort, quietness, and safety via an all-new body based on the design ideas of TNGA (Toyota New Global Architecture), such as high-level body rigidity achieved through ring-shaped frame structures. The comfortable interior reduces driver fatigue even over long distances, and high durability delivers safety and peace of mind whatever the road conditions. The All-New Hiace is powered by a new 1GD-FTV 2.8 L engine that has a high-boost turbocharger, 176 horsepower, intercooler system, Exhaust Gas Recirculation (EGR), and Dual Mass Flywheel (DMF) that leads to reduced cabin noise by absorbing engine vibrations. It also offers better handling with variable power steering, lighter gear shifting, and a MacPherson strut front suspension system with leaf spring rear suspension. With its new drivetrain, the All-New Hiace is powerful and more fuel efficient than its previous generation—making it a vehicle you can truly rely on. Considered a Toyota hallmark feature regardless of vehicle segment, the All-New Hiace is equipped with advanced safety features equivalent to five stars in the Euro NCAP. The transition from a cab-over design to semi-bonnet additionally increases collision safety. Toyota is also the first manufacturer to include a center seat airbag on a utility van for its front center passengers, for a total of 3 Supplemental Restraint System (SRS) airbags for the Commuter Deluxe and 2 SRS airbags for the GL Grandia and GL Grandia Tourer variants.